This script will allow you to setup terrain tags that enable you to swim upon, once you are swimming on the tile it the becomes passible until you leave the water. #how many frames does it take for 1 oxegen picture to disapear? #how many initial oxegen blocks(pixles) are there? use of this script in commercial games is prohibited, credit would be appreciated but not required. I have merged your topic with the original script's posting. Please, in the future, if you have a question or a problem with a script that you can find in the script database, post in that topic instead of starting a new one. Who knows if other users may happen to have the same question as you. Also, you forgot the code tags. There is also nothing wrong with providing a link to where you got the script from. I believe the problem is due to different superclasses. 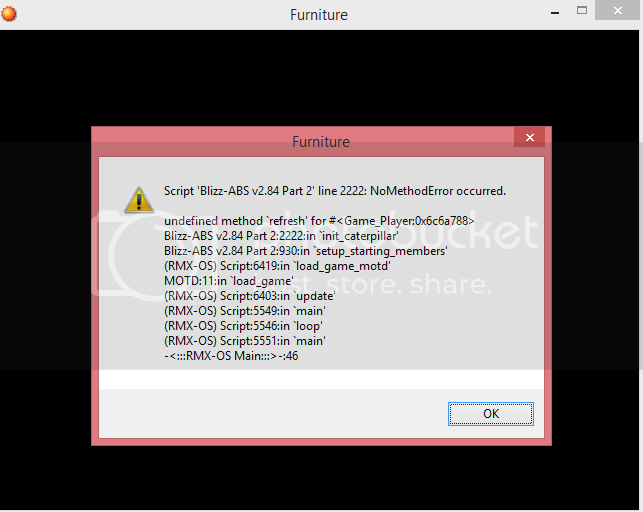 Game_Player extends Map_Actor in BlizzABS while this script assumes the default (Game_Character). If this doesn't work, the two scripts are currently incompatible. thank you will try it, sorry i didnt see it on this site.